Get your prep on with J. Crew's new arrivals. Things have been a little rocky for J. Crew recently. Your favorite preppy-cool brand has struggled in recent years with a crisis of identity. When Kylie Jenner and the Instagram crowd are leading fashion trends, where does a brightly-colored, gingham-obsessed heritage brand go? Well, after trying to shake up their image a bit, Jenna Lyons & Co. have truly embraced the preppiness of J. Crew, and it has paid off. Now that J. Crew isn't trying to be something it's not, it's unveiling some truly fun clothing that will keep you looking stylish all summer long. From off-the-shoulder tops to trendy rainbow stripes, these pieces are for the girls who love color and aren't afraid of standing out from the crowd. And because there are so many great new items, I've styled seven outfits for a number of summer occasions, so you can literally wear nothing but J. Crew all summer long! I saw this iridescent clutch at The Grove a few weeks back and fell in love. Any accessory that could potentially blind people due to sheer shininess is an accessory I want to have. Because the clutch is such a standout piece, let it do the talking and pair it with a comfy T-shirt dress and trendy flatform espadrilles. Add a pair of sparkly earrings for some extra bling and you've got the perfect weekend brunch look. 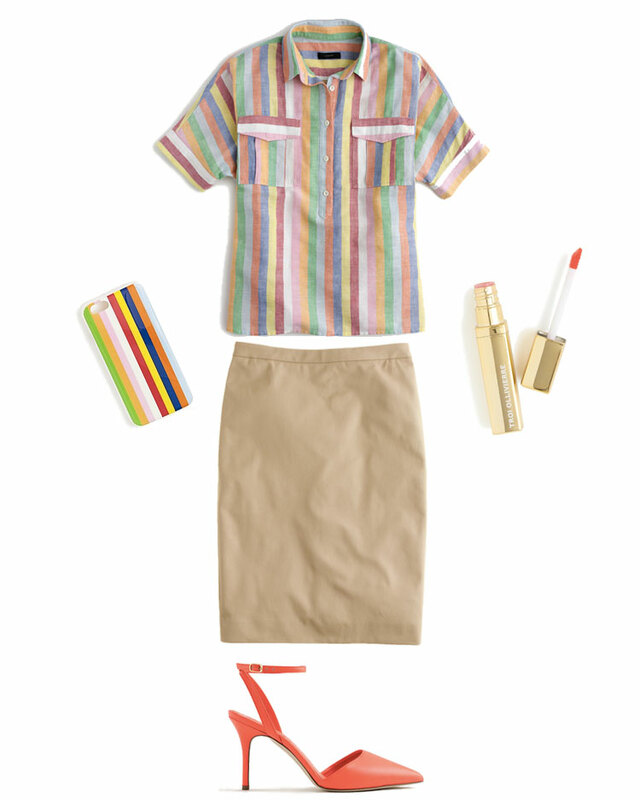 Who says you can't incorporate the whole rainbow into your workday wardrobe? This technicolor-striped top is so fun for work and play (wear it unbuttoned for a sassy beach coverup), so let it do the talking and pair with muted neutrals. Draw out some of the fun color in your accessories, like your shoes and your lipstick color and pull your hair into a J. Crew catalogue-worthy messy bun for the perfect 9 to 5 look. I love the laid-back look that is vintage-style jeans paired with fun heels. The Roxie pumps come in a neat print with the perfect pop of color, so draw that out in a simple but brightly-colored silk camisole. Fringe earrings and a woven clutch add just the right amount of flirtatiousness for an evening of fruity cocktails in a trendy bar downtown. J. Crew has a way of making unexpected color combinations work, so why not try lemon and raspberry? This gorgeous lace dress is perfect for a summer wedding, and this super fun necklace would bring the perfect amount of bling to the neckline. 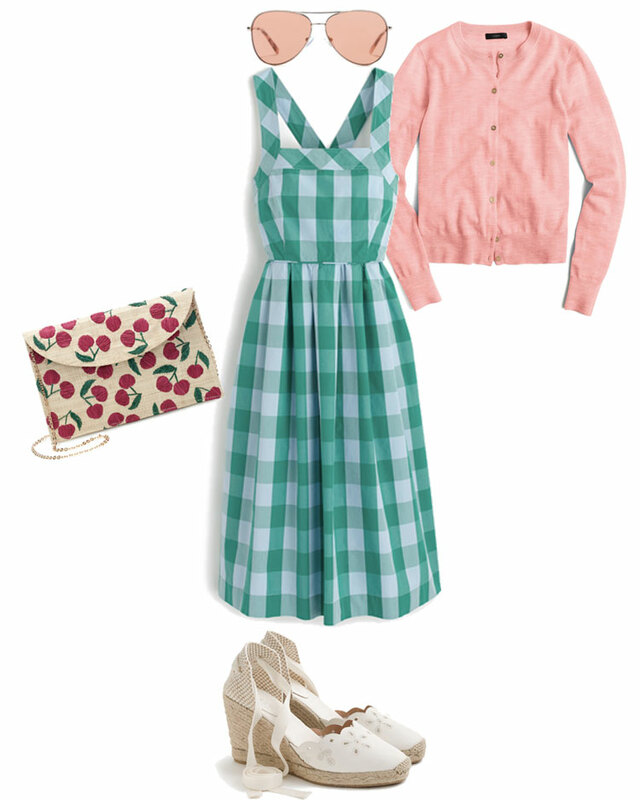 And I mean, come on, who can resist a good summer gingham? Okay, summer sailing is like the ultimate in preppiness, so you might as well go full out with an outfit of primary colors. The T-shirt may be a little on the nose, but paired with cool sunglasses, a chic neck scarf, and of-the-moment espadrilles, this look is anything but basic. And hey, why not grab your matching yellow anorak in case it gets a bit windy on the high seas! Planning a day of checking out museums and wandering busy streets? You'll want a cute yet functional outfit to get you through the day. 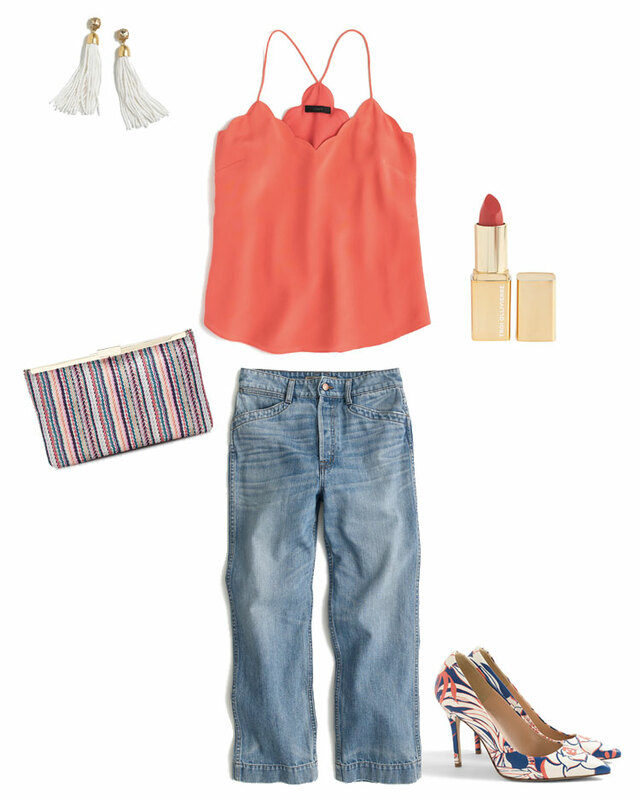 You should never say no to a good off-the-shoulder top, and tucked in to a button-up denim skirt, it's the cutest! (just be careful of where you sit, lol). You'll want a trusty pair of sneakers for all the walking you'll be doing, and a classic jean jacket for the evening. Bonus, this is the summer version of the Canadian tuxedo! You could go casual for a low-key get together, but you're a J. Crew girl, so I say go Betty Draper with the most stunning green gingham dress that's just begging to be worn on a picnic. A cherry print clutch is cheeky but also thematically appropriate, and the wedges will keep you from teetering on the grass. Tie the sweater around your shoulders, country club style, but let the modern shades keep your outfit squarely in the 21st century. See, there are so many cute new things! And good news: you can get 25% off (or 30% off if you're a J. Crew cardmember) until midnight tonight! Score! Shop J. Crew's new arrivals now! Which outfit is your favorite? Love all your picks! I seriously want to get everything! I know, right? It's going to take a lot of restraint to NOT buy everything, lol. Thanks for reading, Ana! This is one place I do need to shop more. Never really shopped there before. They do have the cutest stuff though. It was hit or miss for a while, but they have so many good pieces right now! Thanks for reading, Kierra! Me too! Thanks for reading, Hanna! Wow, you've got nearly every spring/summer event covered here, girl! I love all the looks you've created, that iridescent clutch captured my heart, haha! Thanks so much for sharing and I hope you're having a great start to your week so far! Thank you, Jalisa! The clutch is definitely on my summer wish list, it would be perfect for so many occasions! 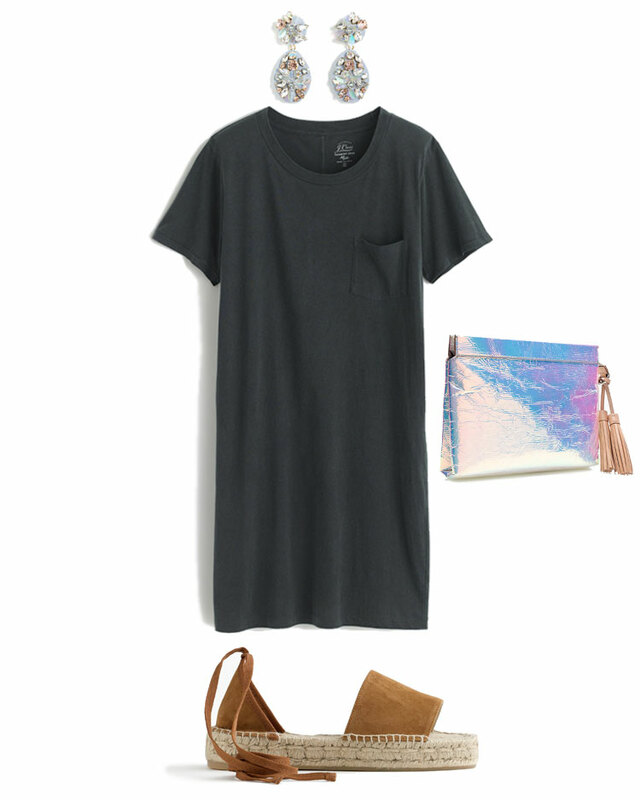 There's also a matching iridescent tote bag that I wouldn't mind having, either! Hope your weel is going well too! I love the casual weekend brunch look, it's my favorite of them all. Beautiful post! It's definitely one I would wear. Personally I'm obsessed with the clutch! Thanks for reading! Seriously, loving their spring/summer collection. I want everything!! Love the looks you created! Totally agreed, J. Crew is crushing it right now! Thank you for reading! Love your selection! J.Crew is one of my favorite brands. Its classy, clean and chic at the same time! Thanks for sharing. Thank you so much, Vanessa! And yes, J. Crew is such a classic brand, you can always count on it! This is such a great post! I adore J.Crew camis...that scalloped on is calling my name. Also, those platform suede espadrilles are soooo good!